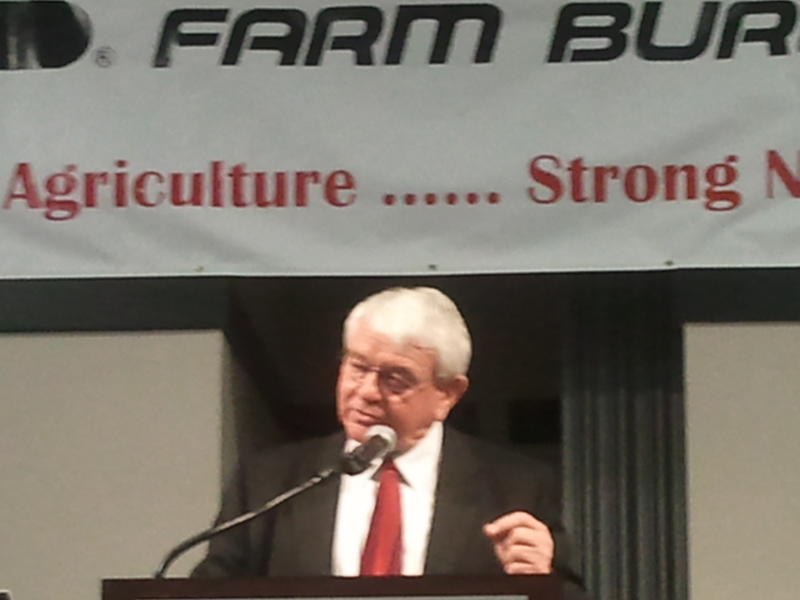 Many times we talk about Farm Bureau being a family. It’s easy to see why having just attended the Nebraska Farm Bureau Federation’s 97th Annual Meeting and Convention in Kearney. The convention represents a chance to see old friends, make new ones, gather to enjoy good food and entertainment, and talk about the many issues that affect the way farm and ranch families make a living and to work collectively to find solutions to those issues. While I reference the convention, I realize we have many members in Farm Bureau who don’t make their day to day living on the farm or ranch. If that description fits you and your family, please know the work that’s done by Nebraska Farm Bureau Federation throughout the year does touch you and your family in many ways. Over the years I’ve had many people who aren’t involved in agriculture ask me why they should be a Farm Bureau member. There are lots of reasons that quickly come to mind. Access to insurance products through Farm Bureau Financial Services is clearly a benefit. So is the large list of other member benefits that range from discounts on Chevy vehicles, to saving money on a family trip to the Great Wolfe Lodge, and everything in between. It’s also no secret that when Nebraska farmers and ranchers do well, Nebraska’s economy as a whole does well. That’s been proven time and again. 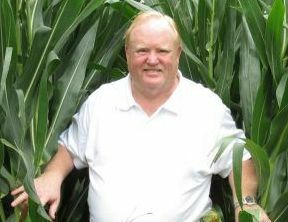 And of course, the very heart of the Federation is that we support the people who raise our food, which is important because we all need to eat. All those benefits aside, the thing I really try to emphasize is that when you’re a member of Farm Bureau you’re part of something bigger. You’re a part of an organization that wants you to succeed. And it doesn’t matter whether that success comes in the form of growing food or protecting what matters most, your family and your home. As a Farm Bureau member you are truly part of a larger family. For that I thank you. 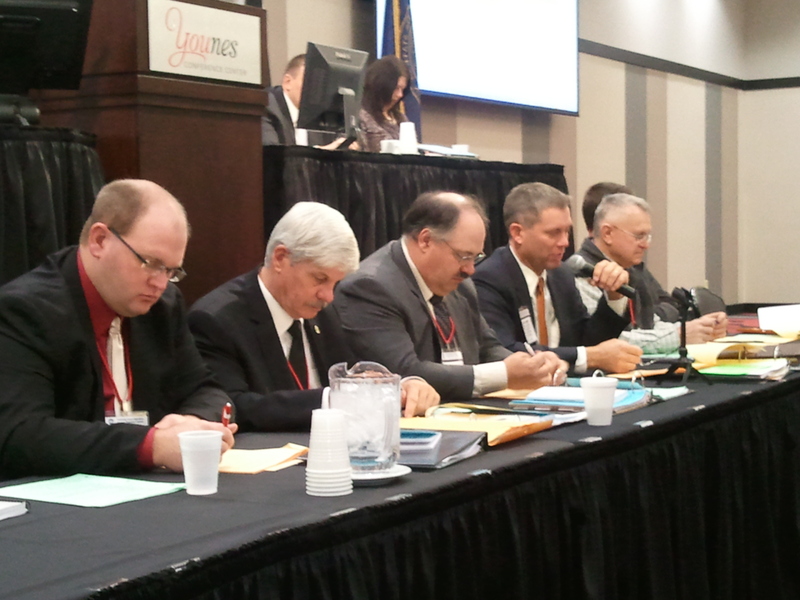 Today, the Nebraska Farm Bureau delegates voted to elect Steve Nelson as the new President of the organization. Click here for photos of Steve. Mark McHargue has been elected first vice-president. Click here for photos of Mark. Learn more about ag families in Nebraska by visiting www.nefb.org. And while there, be sure to connect with us on Facebook, Twitter and YouTube. Farm Bureau’s 94th Annual convention kicked off Tuesday with grassroots member involvement at its best as delegates have gathered to discuss and debate proposed policies on state and national issues. Subcommitees of the State Legislative Policy Committee are called upon to explain their work in proposing changes and additions to existing policy in the areas of taxes, natural resources, ag policy and education, government and social issues. This is followed by delegate action/voting on the proposed policies or changes. Up for discussion are topics such as taxes on agricultural land, commodity checkoff programs, conservation easements and water. Check www.nefb.org or visit the blog for more updates from the meeting. 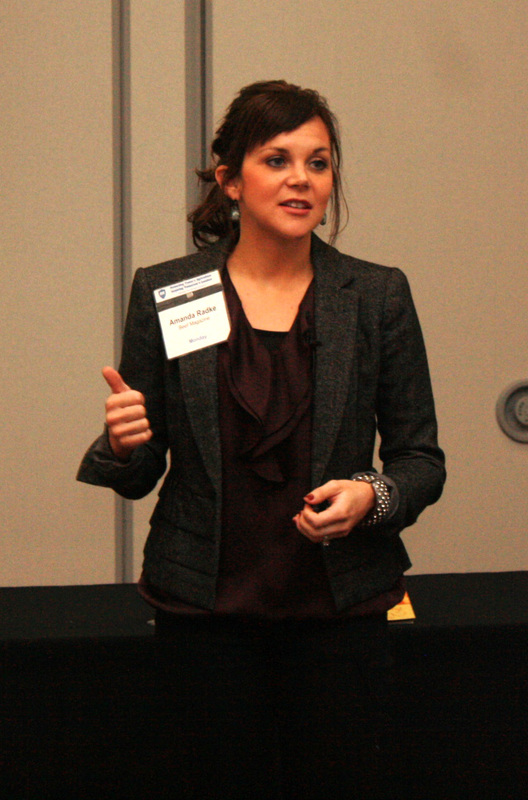 Amanda Radke, editor of BEEF magazine’s BEEF Daily, joined Nebraska Farm Bureau annual convention attendees for a breakout workshop entitled, “Promoting Agriculture Through Social Media”. Radke encouraged a room-full of members to make it R.A.R.E. – relevant, articulate, reliable and enabling. Visit www.nefb.org or continue to check back to the blog for more meeting updates. “Many state Farm Bureaus have asked me to come speak and to be motivational and inspirational. Then they ask me what’s going on in DC. 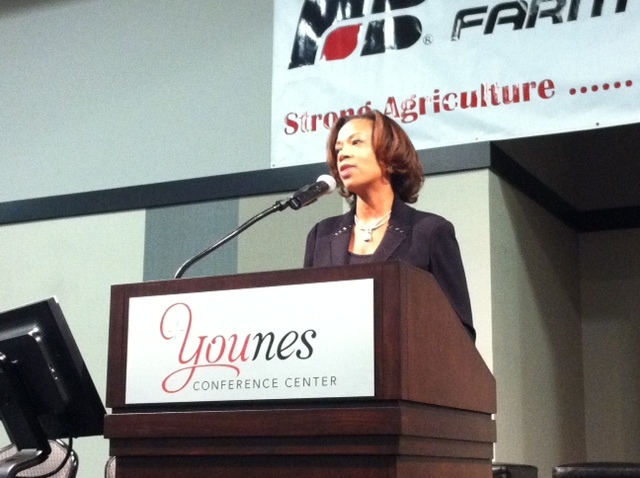 “You’re never supposed to say things are good in agriculture but as an aggregate, things are good. Trade numbers are increasing, exports are good; but we have record-high expenses and things will change. “I commend your state and the atmosphere … your Governor even stood up to HSUS. But we’re facing challenges with the expectations of society. And the studies commissioned by USFRA (US Farmers & Ranchers Alliance) show that consumers want to be talked WITH not AT. Visit www.nefb.org or continue to check back to the blog for more information from the annual convention. 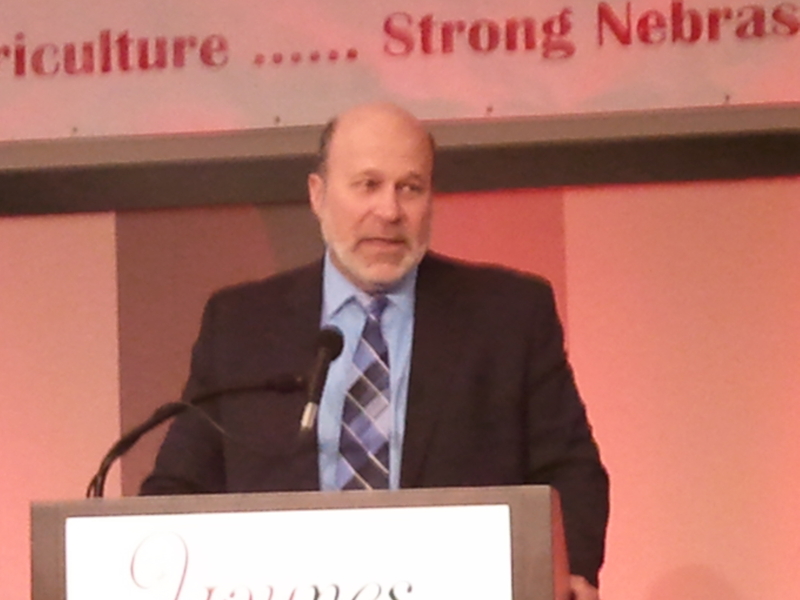 President Keith Olsen took to the podium this morning to address Nebraska Farm Bureau annual convention meeting attendees as the last time as the group’s president. Olsen will retire his gavel tomorrow afternoon. “There will be pain no matter what is done or not done. The new farm bill didn’t happen so in 2012, writing will take place according to usual protocol. There will be less money for agriculture, but we know there’s strongn support for a farmer safety net by expanding crop insurance. “Recently, the Free Trade Agreements were passed and I thank our Farm Bureau members who took time to get involved and write letters. With regards to transportation, thousands of people wrote comments and the rule was withdrawn. Right now, we’re facing child welfare regulations and members need to provide feedback as we hope to provide a safe environment for children but want them to have the opportunity to develop a strong work ethic on our farms and ranches. “I will not accept rules from groups who think they are right and if we disagree with them we are wrong. “We must tell our story and we must speak up. We can tell our story like no one else can. Follow the blog or visit www.nefb.org for more updates from the annual convention. 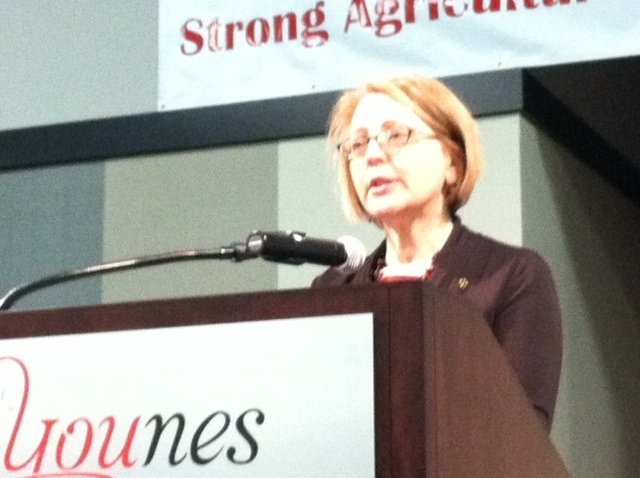 Today, McDonald’s executive Debbie Roberts told Nebraska Farm Bureau annual convention attendees that the company philosophy they live by every day is, “Do good to be good.” They are partnering to promote better health, sharing nutrition information with customers, looking at safety and sustainability processes, and preparation techniques in order to serve good food, better serve our communities and their suppliers. She says consumers are more saavy and are looking for authenticity, transparency and integrity, and McDonald’s is committed to bringing their customers these things, but they must continue to share their story. Susan Forsell, vice president of U.S. supply chain management/quality sytems and sustainable supply for McDonald’s, also joined the group and said success all starts on the farm. The challenge for McDonald’s is to find new products made in new ways while keeping the prices low to sell to their customers at a value. And she says brand trust goes from farm to customer: farm to supplier to distributor to restaurant to the customer — for all of this to work, open communication and transparency is a must. Sustainability is important to McDonald’s because it goes back to their core values. Studies conducted for McDonald’s show that food production issues and environment are important to their customers; 90% of employees want to work for a responsible organization; and McDonald’s vision for a sustainable food supply is that the supply chain is ethical, environmental and economic. 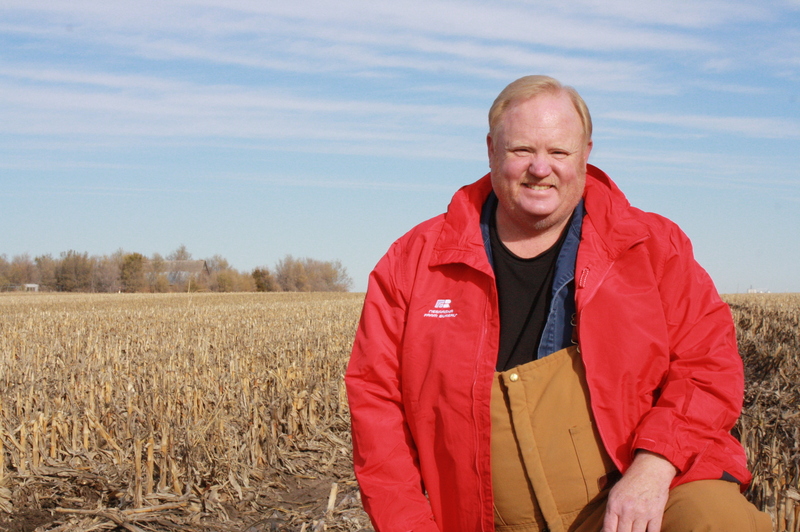 Forsell echoed Roberts’ by encouraging farmers to tell their story – the miracle of the food system – to consumers because they are so disconnected from the farm. By the way, did you know Nebraska was actually one of the first markets to introduce the Happy Meal? Continue to check back to the blog or www.nefb.org for updates from the annual convention.